As a painter, Jesse Cuellar is not much different than any other artist. His experiences have been numerous and diverse, and he draws on those experiences to create things of beauty. What does differ about Jesse, however, is his method: he paints with his mouth. "Fundamentally, it's the same as painting with your hands," Jesse said. "I don't see it as an obstacle." Jesse has been painting all his life, but he didn't always do it this way. When he was 27 years old, he fell off a roof and broke his neck, which resulted in a severe spinal cord injury. 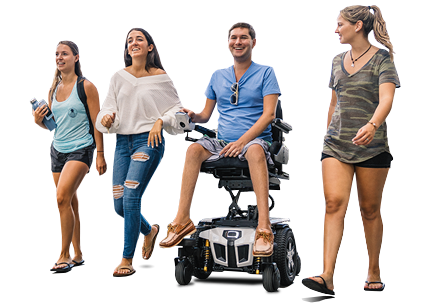 Now 31, Jesse uses a Q6 Edge® Power Chair from Quantum Rehab® to get around. "The Q6 Edge is a great chair," Jesse said. "It rides smooth and allows me to get places I wouldn't otherwise go. It's basically my feet." Throughout his life, Jesse has painted both professionally and as a hobby, taking inspiration from everything around him. "How I'm going to paint on any given day depends on what that day brings," Jesse said. "Whenever I wake up, there's always potential for new ideas." When he is asked to paint something, Jesse will either get some direction from the client and do it his own way or get an idea off the top of his head and develop it as he goes. In either case, he always manages to leave his mark. "I used to just paint for fun, but now, it's my job," Jesse said. "Doing something you love for a living is incredibly rewarding." In addition to painting, Jesse enjoys spending time with his friends and going shopping, particularly for shoes. Whether he's out and about or down in his studio, Jesse is always doing something. "My Edge allows me to experience the world much more easily," Jesse said. "That's important, because those experiences become fuel for my art." 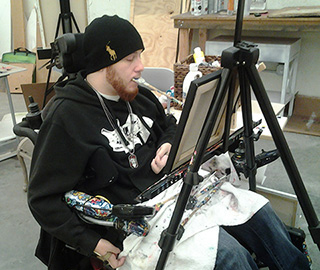 Jesse has also done some motivational speaking, talking to others with spinal cord injuries and painting for them. Jesse said that if his personal experiences have taught him anything, it's that no obstacle is unconquerable. "I learned that no matter what kind of situation you get put into, there's always a way out," Jesse said. "You can be either negative or positive, and I choose to be positive."